It’s kind of mind blowing to think that Fedor will be fighting about 10 minutes from my house. But now it is official. Here’s the release from Strikeforce, and we’ll be covering this event like we do all the big events that come to town: interviews, videos, previews and more. NEW YORK (Sept. 23) — The highly anticipated STRIKEFORCE® and M-1 Global co-promoted heavyweight showdown between Fedor Emelianenko (30-1) and undefeated American heavyweight Brett Rogers (10-0), will take place at Sears Centre Arena in Hoffman Estates, Ill, located just outside of Chicago, on Saturday, Nov. 7. A special pre-sale ticket purchase opportunity will take place for “STRIKEFORCE Insider” e-newsletter subscribers (www.strikeforce.com/signup.asp) beginning at 10:00 AM, CT Friday, Sept. 25, and ending at 10 PM, CT on Sunday, Sept. 27. STRIKEFORCE Insiders will receive a special e-newsletter tonight with the pre-sale code. Tickets, priced from $35, go on sale to the general public at 10:00 AM, CT on Monday, Sept. 28 at Sears Centre box office as well as at all Ticketmaster locations (800-745-3000), Ticketmaster online (www.ticketmaster.com), STRIKEFORCE’S official website (www.strikeforce.com), and M-1 Global’s official website (www.m-1global.com). 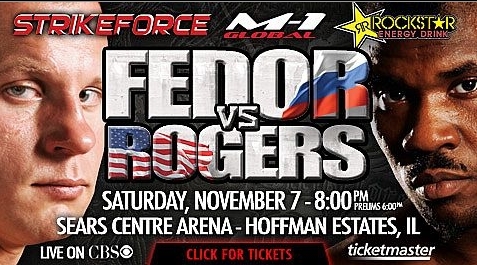 Doors at Sears Centre will open at 5:15 PM, CT for the STRIKEFORCE and M-1 Global: “Fedor vs. Rogers” event presented by Rockstar Energy Drink and the first preliminary bout will begin at 6:00 PM, CT.
Lots of people underestimate Rogers, of course he is not skilled as Fedor but he always have chance for KO. But , probably Fedor will win via sub.